​Play as the daemon-hunter Baron Dashforth in a side-scrolling co-op brawler set entirely on the grand spectacle of a theatre stage that rewards performance over pummeling. 22 Incredible Acts: From the deserts of Cairo to the depths of Atlantis. Over 50 hideous enemies drawn from the Baron's recollections. Learn 12 Electrifying stage-tricks to bring the house down. Have a friend join as sidekick Scampwick in Local & Online Co-op modes. Beautifully animated scene changes re-create the Baron's adventure. Never before seen 'Daemon Diary' charts the discovery of Daemonology. ​Play as the daemon-hunter Baron Dashforth in a side-scrolling co-op brawler set entirely on the grand spectacle of a theatre stage that rewards performance over pummeling. Perform shattering takedowns and reversals! Electrify the audience with devastating linked attacks as you have a friend join as sidekick Scampwick and use every stage-trick you know to bring the house down! 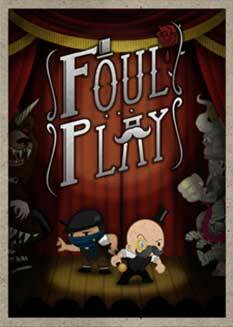 Play out the most spectacular moments of the Baron’s life; improbable beasts, astonishing villainy and, at the heart of it all, the mysterious Foul Play! The best beat 'em up since Castle Crashers.